I handed in my final assignment for the term at university this morning so now I am free for the next six weeks. I couldn’t be happier about this; the last few weeks were very intense and I’m not even sure how I got through them. I definitely need a break right now. This will be my last long holiday ever. When I finish my law degree at the end of the year I won’t be able to completely relax for the summer holiday as I have every other year. I will have to get a proper job for experience in the legal industry and to earn money because Rydog and I are moving out at the end of the year and will have many expenses. Although I have hated every moment of university it makes me sad that the long holidays associated with being a student are almost over for me. It is important to enjoy this break. It reminds me that my life is going to be changing in so many ways in the near future. In true blogger style, I came straight to my blog as soon as I’d handed in my assignment. A new post was at the top of my agenda. But since I still have no opportunities to take outfit pictures, that sort of post will have to wait until later in the week. In the meantime I thought I’d show you some of my recent purchases. Many of them were an attempt to motivate myself to study. If that’s whats needed to pass a law degree then that’s ok, right?!?! The main reason I decided to buy this dress was because of the low back; I know you can’t tell from the photos but it actually has a deep v at the back. I am aways drawn to clothes with interesting backs. Plus I love lace. 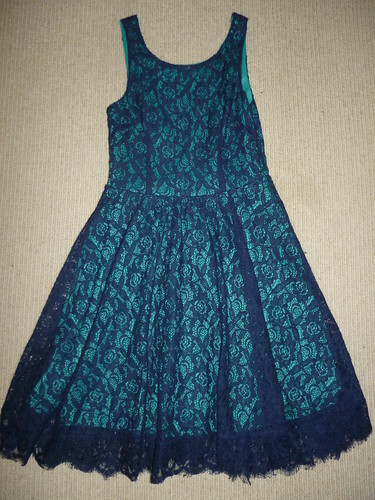 This dress came in three different colours; green & blue, green and white & coral. I went for green & blue because I thought it was the most classy and I already have a green lace dress. I bought this dress today. For many years I haven’t really liked white but recently I love it again. The fresh and clean look of a structured white dress is very desireable. 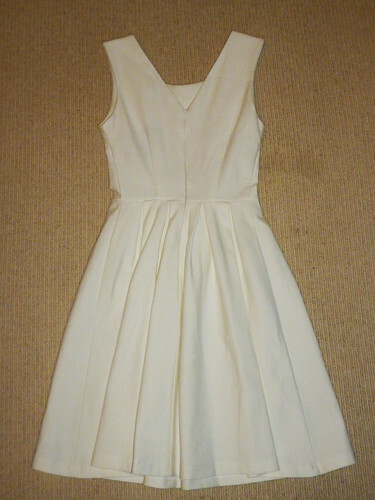 I’d been searching for a white dress with great difficulty until I came across this one. I hope it will be one of the more verstaile pieces in my wardrobe. I often find black dull and boring so I thought this kind of neutral item was exactly what I needed. This is one of my favourite and most worn items right now. I love the red and blue together and the detailed sparkly buttons are amazing. The cherries are the sweetest ever. I also adore this cardigan because it is 100% wool; it’s so comfortable and warm. I fell in love with this cardigan the moment I saw it. I knew it was an item I had to own. I think it’s because of the sweet glitter AH which can be a representation of how much I love Alannah Hill. Of course the sparkle and the silver pretty buttons are very special too. This is the first clutch bag I’ve ever owned. It was just too adorable and unique to pass up and at only $15 it was a bargain. Again the glitter is very exciting and adds to any outfit. I’ve already had many compliments on this bag. Plus my friend Izzy has the same one! Another red item to add to my wardrobe! 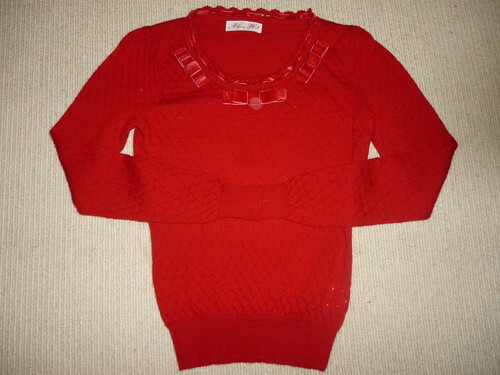 I mainly bought this jumper for its versatility; it looks good over most of my dresses and with a range of skirts. My favourite aspects are the bows (which are excitingly made of velvet) and the sweet little cut outs. Oooooh!!! So many Alannah Hill cardi's!! So very exciting. I love them all and that lacey dress is gorgeous. I really, really like that skater dress. It will look amazing on you! I always rave about you in red, so I am happy to see that you bought a red top. The skater dress is really nice. Been wanting one because it seems you can wear this style is many combinations! final assignment for the term! your Dotti Lace Contrast Skater Dress. Yay for having some free time. Looks like you bought some lovely stuff to treat yourself with. I love that white dress. It's so pretty. I can't believe that clutch was only $15. Gorgeous! Ponti skater dress & fan clutch = amazing! You are going to look amazing in those dresses! I love the clutch and the red sweater!!! Great pieces! I especially love the Alannah Hill cardigans; too cute! Ahhhhhhhhhhhhhhhh drooling all over your purchases. I love the lace dress, interesting backs on clothes are my thing too 🙂 Love your clutch and that green and sparkly cardigan. Such great finds! Enjoy your break! I love that white skater dress and the green Alannah Hill Cardigan is to die for! i love the first two dresses most… great finds! These pieces are all so darling! 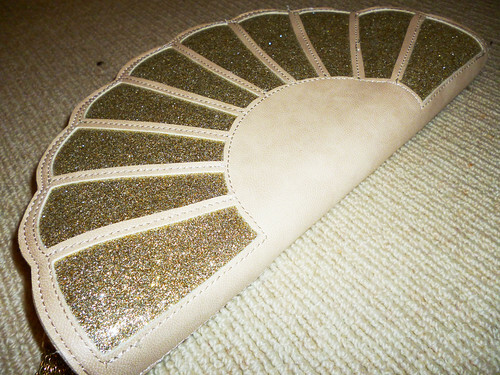 I love the glitter clutch. I'm a new follower and I found your blog on Chictopia. Come visit me sometime! you made so many tremendous purchases! I love them all and I love your vintage style. I am definitely into those skater dresses. Zooey Deschanel wears so many cute ones, have you looked her up before? I want to be her. I love all of your cardigans too!! omg love everything you bought, especially those adorable AH cardigans!! That fan clutch is such a steal at $15! I've gained a lot of respect for ForeverNew bags lately. I just bought one of their black and white structured numbers, and I'm like carrying it every day! Congrats on the break, make sure you enjoy it! I love the new items and I cannot wait to see you style them up! i super love the dresses especially the skater dress! it's to die for!. followed your blog. follow back? Lovely purchases! I really like the clutch 🙂 Enjoy your long break from uni! OH my!! 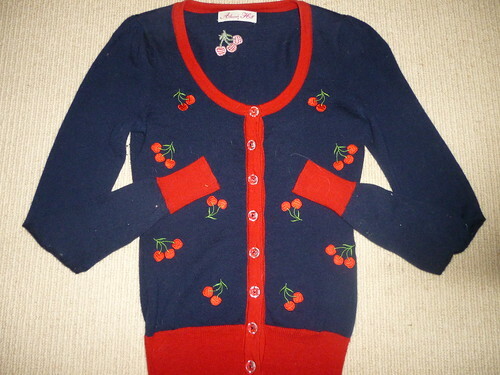 Love your new purchases, especially the cherry cardigan! So sweet!